We had several visitors to our garden on Tuesday. Erin and Roger from Texas Discovery Garden came and were welcomed by a host of creatures and people. We usually are greeted by the buzzing of bees but seldom notice some of the other guests that make our garden their home. 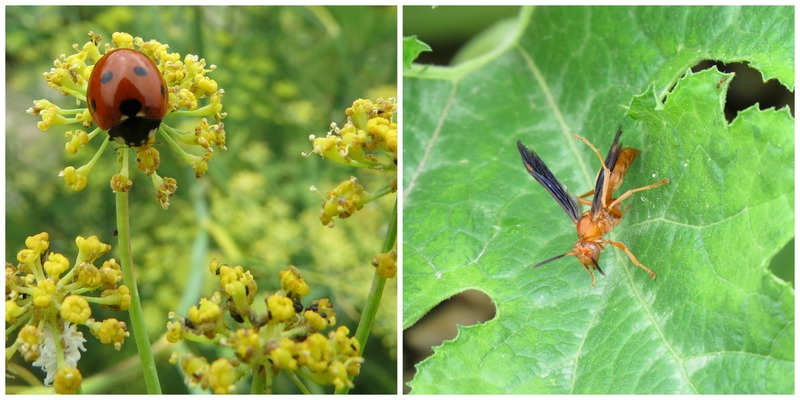 An orange wasp flitted among the squash leaves while the ladybugs had lunch among the fennel. 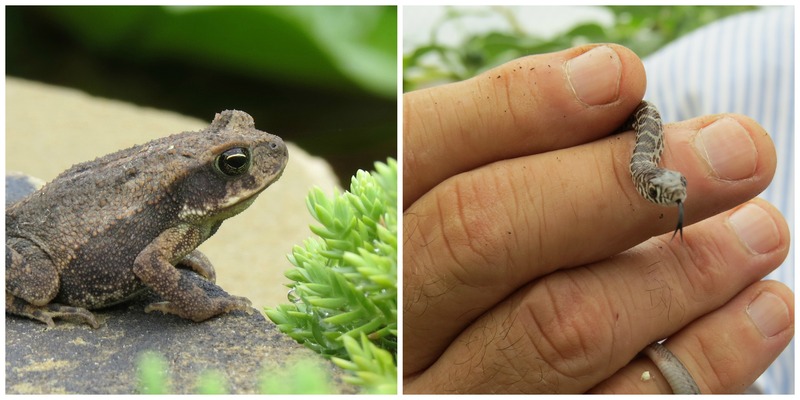 We had surprises amongst the mulch; a little toad managed to ride in the wheel barrow and was relocated near the pond and a snake slithered out from the wood chips. 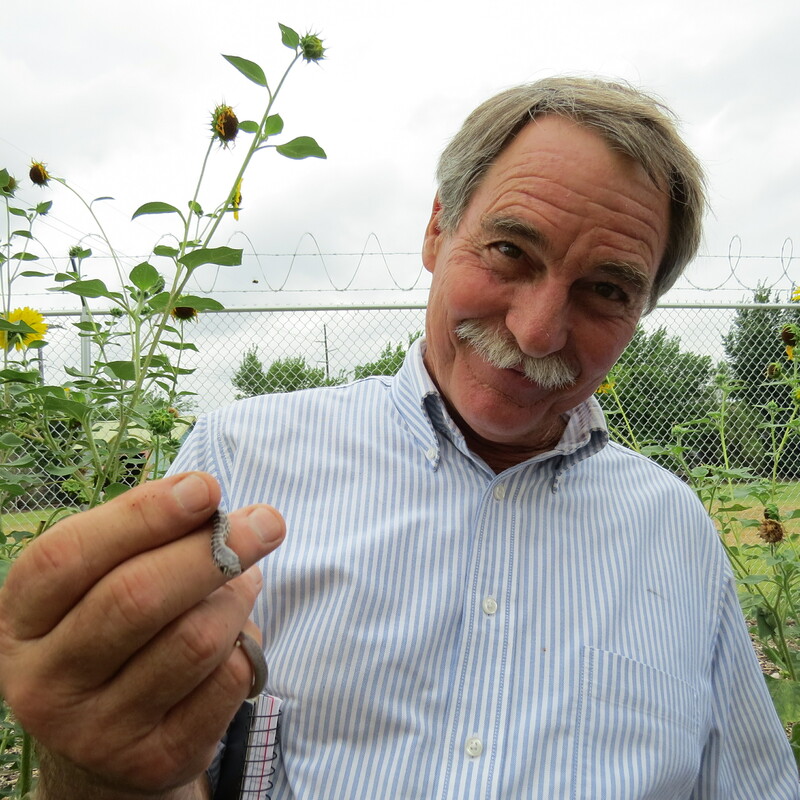 Fortunately Roger Sanderson, Director of Horticulture at Texas Discovery Gardens, is also a herpetologist. He was very excited to learn we found a snake while cleaning out a bed and he quickly identified it as a Yellow- Bellied Racer. To help you identify snakes you may come across, see this Texas Snake ID site. The Yellow-Bellied Racer is a harmless and very fast snake. The one we found Tuesday is very young, covered with spots and blotches. When mature he’ll be solid blue-gray on the upper side and solid yellow on the belly. They eat bugs and small lizards at this age, but as adults they eat anything that moves, including lizards, mice and venomous snakes. The most common snake found in our gardens are the Rough Earth Snakes which are small (6-8” full grown) and feed on tiny insects, worms, and other invertebrates. They are essentially unmarked gray to brown snakes that are paler on the belly. Another common snake in this area, and about the same size, is the little Texas Brown snake. Unlike the Earth Snake, it does have faint marking down the body and a distinct black mark just behind the head on both sides. We love all creatures great and small at our garden, but were happy to add this little snake to Roger’s collection at Texas Discovery Gardens. You can see our snake and everything butterfly at this Dallas premiere organic garden! Texas Discovery Garden is a valuable asset to Dallas. For more information about it so you can plan a visit, click here. Posted in Wildlife Habitat and tagged Texas Discovery Gardens, Wildlife Habitat. Bookmark the permalink.